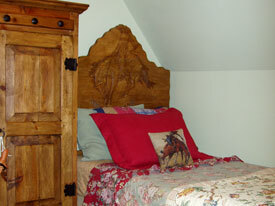 The Cottage is beautifully furnished and contains many antiques - a pleasing blend of old and new. Living areas have cable TV, VCR, and DVD. 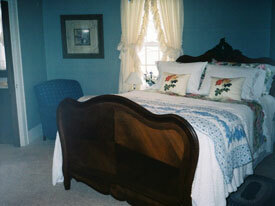 Each bedroom has comfy top-of-the-line pillow-top mattresses, soft luxurious linens and a private bath. A continental breakfast is provided for you to enjoy at your leisure. Pembroke Cottage has a fully equipped kitchen - for your convenience - so you can prepare a nice meal any time of the day. Complimentary beverages and snacks are provided. We are eager for you to enjoy this quaint romantic refuge. Pembroke Cottage is a peaceful, relaxing retreat you will not soon forget. 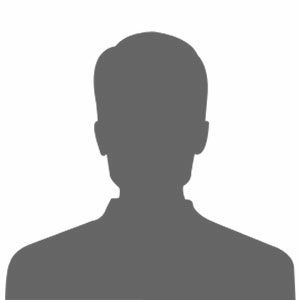 Make yourself at home and come back often! 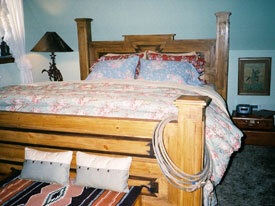 Has a distinctively cowboy flavor with massive king bed layered in fine linens. An over-sized leather chair and ottoman, cowhide rug, antique dresser and other antiques compliment the old west feel of the upstairs. Makes you just want to kick off your boots and unwind.